Today I'd like to talk about my favorite part of a living room: the coffee table! If you are anything like me, than your coffee table gets put to good use. In fact, you might use it as a dinner table, foot rest, desk, buffet table at parties, and library for your favorite coffee table books. Or is that just me? 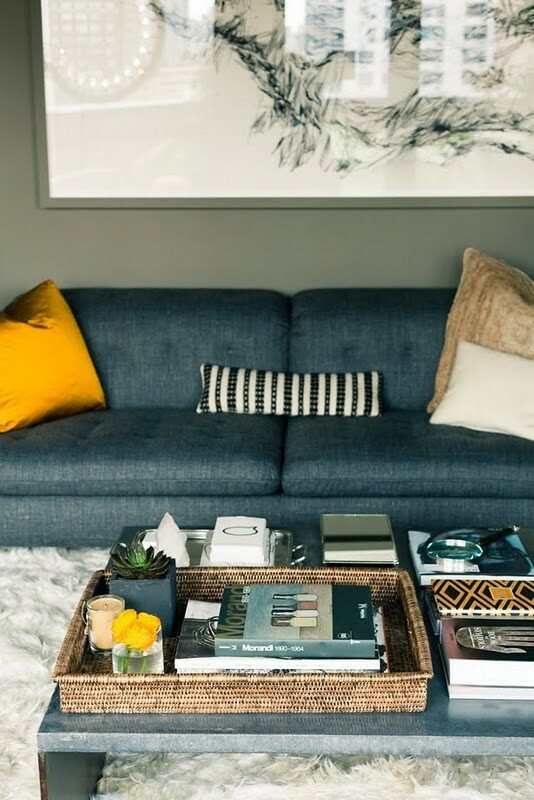 Whether your coffee table is used with frequency or nearly neglected, it's important to style it well. First, we must consider function. Do you often utilize your coffee table as a dinner table? Then space must be left for eating. Do you have 10 different remotes for your high-tech TV sound system? Then they will need a place on the table. Is your coffee table more of a decor element only? Then gracing your table with books, candlesticks, or fresh flowers will add an extra touch of pretty. What if you want your coffee table to be both functional and stylish? You might notice they never photograph remotes lying on a coffee table in interior design magazines. I suggest finding a beautiful box to hide your remotes inside. I hide ours in a mercury glass container I found in the bed and bath section of Anthro. What do you think? Megan, from Honey We're Home, displays her remotes in a chic lucite tray. This is another great option to fuse functionality with decoration. 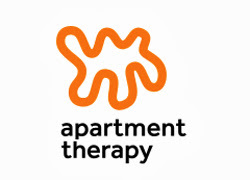 Afraid your coffee table will appear cluttered after you gather your favorite books and magazines, and also make room for coasters, remotes, and other necessities? Stack items neatly in trays to create a more organized space. Because I collect coffee table books, I like to display a few that might entertain guests. I love it when I go over to someone's house and can get an idea of who they are and what they love. Showing an array of books, framed photos, or other trinkets help tell your story in a subtle way. What's sitting on your coffee table? Do you have a favorite tip for styling it well? I'd love to hear it! Today I am guest posting over at The Urban Slant about King Louis chairs. Be sure and go check it out! I like to keep my coffee table free of items, but we always have a side table next to the couch for my coffee table books. Love all of these inspiring images! great images! once my move is done, i will definitely be styling my coffee table. 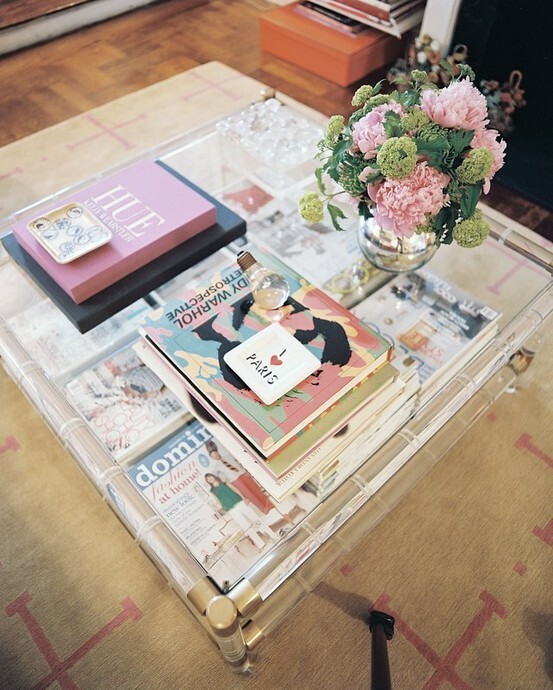 That first image with the lucite coffee table is perfectly styled and SO CHIC. These are some gorgeous coffee tables! I have a large tray from west elm, some mercury glass votives, a few books, agate coasters, and a stack of new magazines. Love it!!! I love stacking books on my coffee table! I want a coffee table sooo bad! But we're waiting until we buy a home to get one. We don't want to ruin it moving in and out of places... plus my husband doesn't want to have to lug it around each time we move, haha! I'm constantly reshuffling mine. Love you mercury glass box for remotes. And that lucite and brass coffee table is stunning! That first coffee table is awesome! It's great because you can display things on top to show off... but also what you put underneath can be seen from above too! It's a win-win! Cute! I need to decorate my house better. I change mine out a lot, but generally its some books, a favorite trinket and some candles. Sadly I eat at my coffee table too often. Hate that! The first coffee table is so gorgeous. Love the inspiration. I'm in the hunt for a coffee table now and just fell in love with the acrylic and gold one in the first picture. Great round-up Sam! on my coffee tables i have my favorite books... love them! that second photo is really my idea of perfect! Lovely! And I think a major key is some cool coffee table books! Gorgeous coffee table stylings! 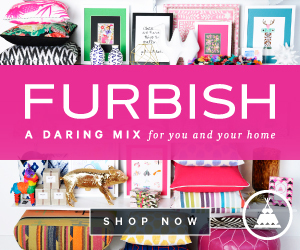 I want that box from Anthro!! P.S.-Thanks for your super sweet comment on my guest post over at B&B today, that really means a lot to me! I use a big tray on the my table to hold my magazines and remotes. 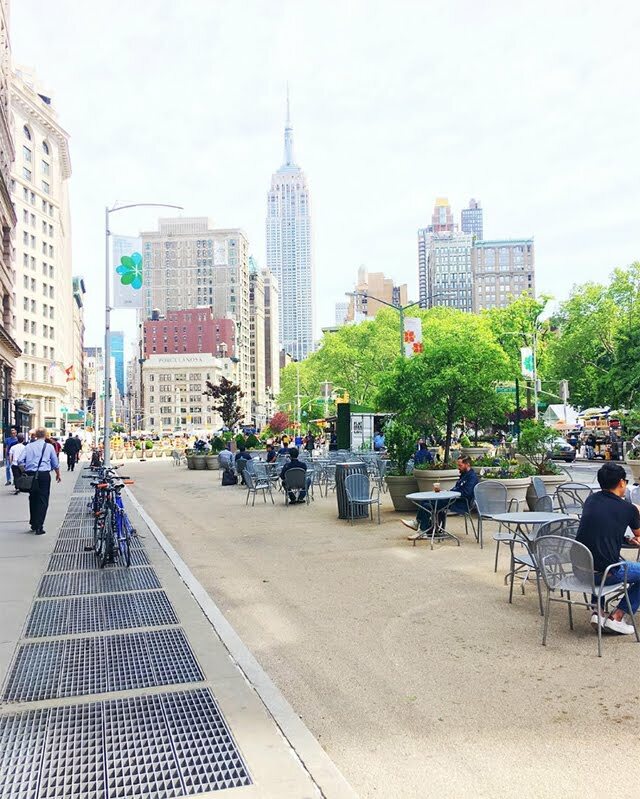 I am always wanting to switch things up, these are some great inspiration pics! Just don't be like me and leave a dish full of Hershey kisses on the coffee table or you might come home to a Chihuahua who has crawled his way onto the coffee table and eaten all of them!!!!! Love this! My coffee table is one of my favorite design elements of a room and these pictures are fantastic! 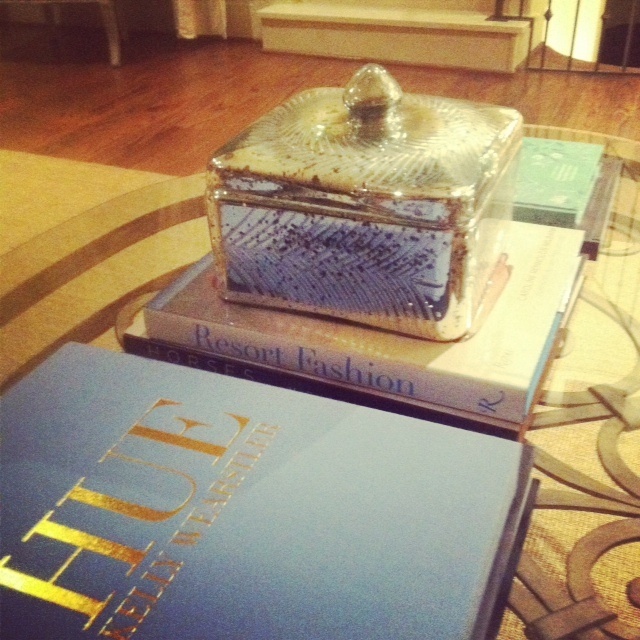 Gorgeous inspiration -- can't wait to have a tiny bit bigger place so I can pick out and style the perfect coffee table! These are all beautiful! I love decorating our coffee table as well - loved the first two photos especially. Have a great day! I just love that first picture, and your TV remote box is beautiful! uuh yes...my coffee table is in DIRE need of styling! I want to get some lucite trays...but it won't really go with the wood/wrought iron table...so maybe I can do that luggage stacking! I am working on adding more books to my coffee table collection and unique pieces that can start a conversation. Your mercury box is just perfect for the remotes-such a great idea! i love coffe tables!!! ur choices are perfect! 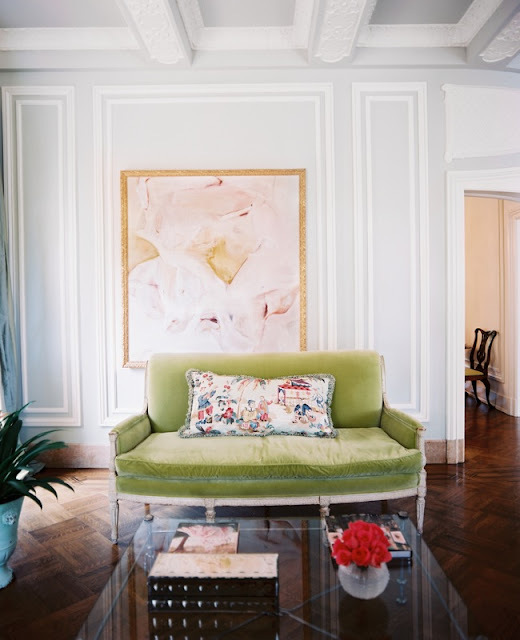 I adore lucite and have been coveting that coffee table for quite some time!! I am also slightly obsessed with design books and love them stacked anywhere and everywhere, but a coffee table with our books just wouldn't be right! 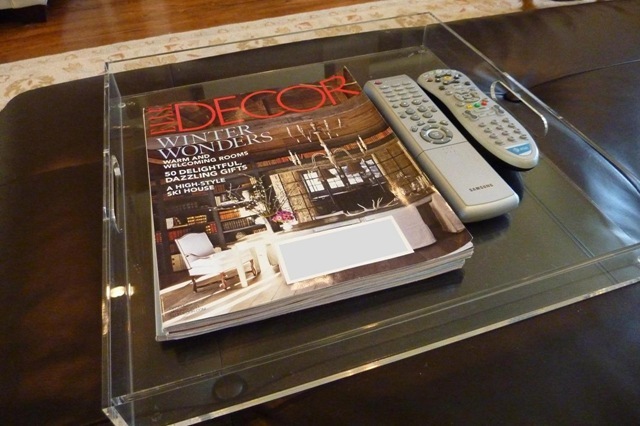 I love trays on coffee tables, especially lucite. Nice pics! 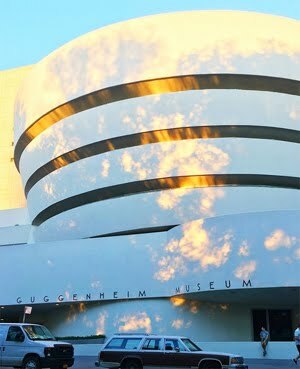 I am loving your blog so much I am adding you to my blogroll. Have a great weekend. So cute, I love the transparent coffee tables!